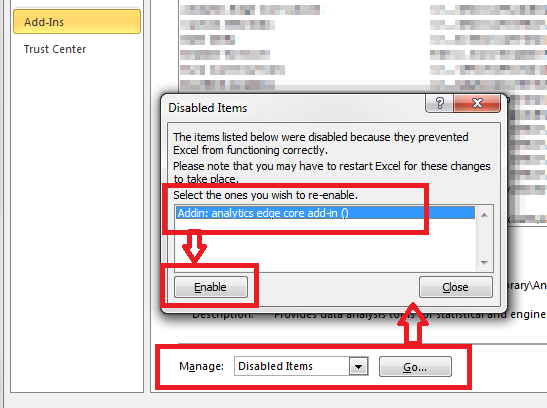 If you get an error about the Ribbon/COM Addin handler, or if the Analytics Edge ribbon bar disappeared or does not appear when you open Excel, the add-in may be disabled, unselected or untrusted by Excel. Sometimes an Excel process gets stuck in the background, and it locks out the add-in. Restarting your computer clears these lockouts. 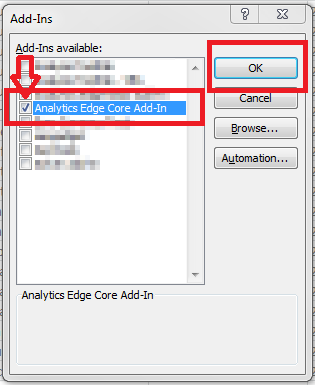 If Analytics Edge is listed in the dialog, select it and click the Enable button. Open Excel File – Options dialog, navigate to Trust Center – Trust Center Settings… button navigate to Add-ins, and UNcheck the entry to Require Application Add-ins to be signed by Trusted Publisher.